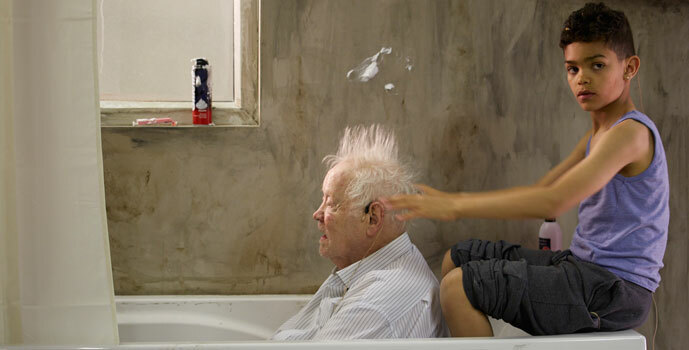 A triptych of performance duets showing the intimate routine of an older man’s daily life. Developed over the course of a year through a special cookery school held in collaboration with St Luke’s Day Centre and Age UK Islington Have Your Circumstances Changed? explores the delivery of care beyond what medicine can provide. 3 – 28 June 2015 | Opening Times: Wednesdays and Thursdays, 17:00 and 19:15; Saturdays and Sundays 14:45, 17:00 and 19:15. The complete performance is in three parts and lasts approximately 75 minutes, including two intervals. Each part lasts 15–20 minutes. Entry: To offer the opportunity to experience the work to as wide an audience as possible we are operating a ‘pay what you can’ policy, with a suggested donation of £12 to secure your place to see all three performances. A limited number of tickets for each individual element will be available on the door on a first come first served basis daily. Have your circumstances changed? is developed by Artangel in partnership with Age UK Islington, St Luke’s Community Centre, Central Street Cookery School, and Vital Arts. Supported by the Calouste Gulbenkian Foundation, Co-produced by Islington Council for the Word Festival. Artangel is generously supported by Arts Council England and the private patronage of the International Circle, Special Angels and The Company of Angels.